When I was in high school I discovered anime. Once I did that it was all over. You start with the English dub and move into subtitled Japanese shows and once you’re good at keeping up with the subs it’s all down hill from there. I was a big anime geek, and I always wanted to go to a real anime convention. I went to a little baby one with some friends my senior year, but not to a big one until I was married, oddly enough. This was my first real year at Tekko. So last year I went to Tekko with my brother while he was working the RPG room GMing some games. I mostly hung out with him, played in his games and chatted in between. I looked around, but only very little. We went to the dealer’s room once, which was cool, but that was the most I got to explore. This year my brother wasn’t working the con, which meant I had to pay my own way in, sure, but I also had an adventuring companion! Test run of my outfit. A big part of any geeky convention is the cosplay. Cosplay, for those who don’t know, is when you dress up like a favorite fictional character. I have always loved dressing up and I have always wanted to do cosplay, but never had the time/materials/proper character to dress up as. Well, I have a sewing machine now, and I’d like to try doing some real cosplay next year. For this year, I settled for a little bit of steampunkery. Actual Tekko face. I went with the goggles instead. I treated myself to a bronze colored corset last year and this year my wonderful husband got me a pair of super cool Victorian style boots for Christmas. So I tosesd them together with a bustle skirt a friend made for me. 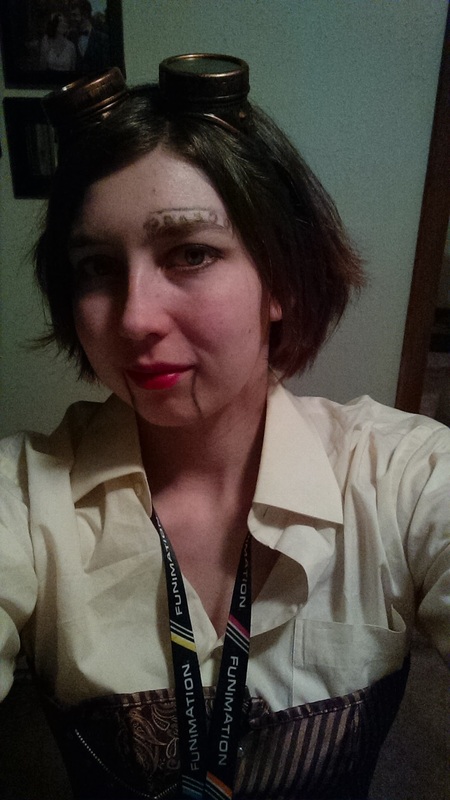 I drew on my face in some black eyeliner and used bronze eye-shadow for paint, because I may or may not be allergic to face paint, and thus I became a steampunk automaton for the first day of Tekko. For the second day I decided to throw together an Elizabeth costume from BioShock Infinite. 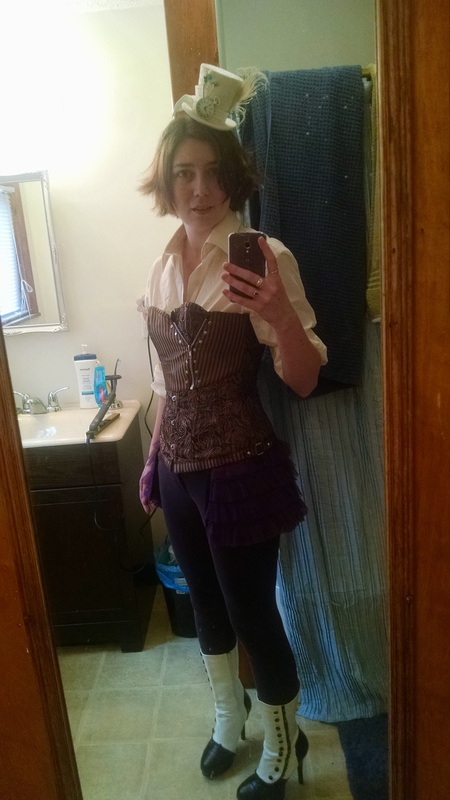 It was a Halloween costume I’d been considering before going with the Steampunk Mad Hatter I landed on, as an excuse to wear my corset, mostly. I only have the basic pieces for the Elizabeth costume, though: a blue skirt and button-up blouse. I didn’t get to put any of the details on either that would make them super recognizable, but I figured I’d go for it, even if no one knew what I was. So I crocheted a scarf to go with it as the last piece to the very vague puzzle and went like that… to a wedding… and then to Tekko. Of course as soon as I got there I saw a proper Elizabeth costume. One of her later outfits, but still, much better than mine. And then I felt a little bad about mine, but I didn’t see her again after that, so it was okay. My brother and I had a lot of fun this year. I only got to play in two games, but one was run by the fabulous Dave, so I was pleased. I haven’t seen him probably since my wedding and it was good to have him as a GM again. He ran a super fun Fallout campaign back in the day that is still my favorite game I’ve played in. We went to a couple panels this year. I learned all about ramen on the first day, and then we went to a very brief panel about cosplaying cheaply, which got me super pumped to try putting together my own costume. The second day we went to a rather dry panel about wolves in anime. The woman wasn’t close enough to the mic so we couldn’t hear her, and the visuals weren’t great. It was rather disappointing. I also dragged my brother to a Kingdom Hearts panel, which I enjoyed, because I love Kingdom Hearts. I’m not sure if he enjoyed it as much as I did, though. My brother also introduced me to this great gyro place in Pittsburgh, right by the convention center. We went there for dinner both nights because I liked them so much, and forgot to wear leggings under my skirt on Saturday. They had really great fries, and we’re Irish, so you know. But really, I love fries, with a probably unhealthy passion. We ran into a lot of old friends from my CCBC days, and high school, oddly enough. I mean, I guess two people from high school isn’t that many, but they were people who recognized me and that I haven’t seen since graduation, so there’s that. Anyway, I also got to see some of my Geneva friends, who hung out with us towards the end of Friday, and my current DM who stuck with us most of Saturday, which was quite lovely. Mostly we people watched this year, which is half the fun of cons, anyway. There were a lot of really cool outfits, and costumes. Lots of steampunk this year. Friday seemed to be RWBY day, where I saw at least one RWBY character in almost every crowd. Saturday was Kingdom Hearts day. I saw so many Kingdom Hearts cosplays, even before going to the panel. There was one guy dressed as Axel who was basically perfect. We stayed super late on Saturday because we wanted to play in a Pathfinder Society game. It was Goose’s first Pathfinder game and we wanted to find a good one to play. It just happened to be the last one of the night, that started at 7. So we went until like 1 am and didn’t get home until 1:30-ish. It was a very late night, but we had a lot of fun. Goose and I have decided we’re going to do some Digimon characters next year, which I really want to pan out. The costumes are super simple and Digimon is one of my favorite things. It’s basically my entire childhood. I also want to actually finish my Elizabeth costume for next year, but I also want to make a White Mage costume with my brother as Red Mage. So any choices. Perhaps I’ll just use Elizabeth for Halloween as I had originally planned and use the other two for the convention. We shall see! Have a lovely day, my friends.